We’ve been plugging away outside this summer, though it is quickly turning to fall here. The leaves are already changing and starting to fall, at least our maples are moving along. 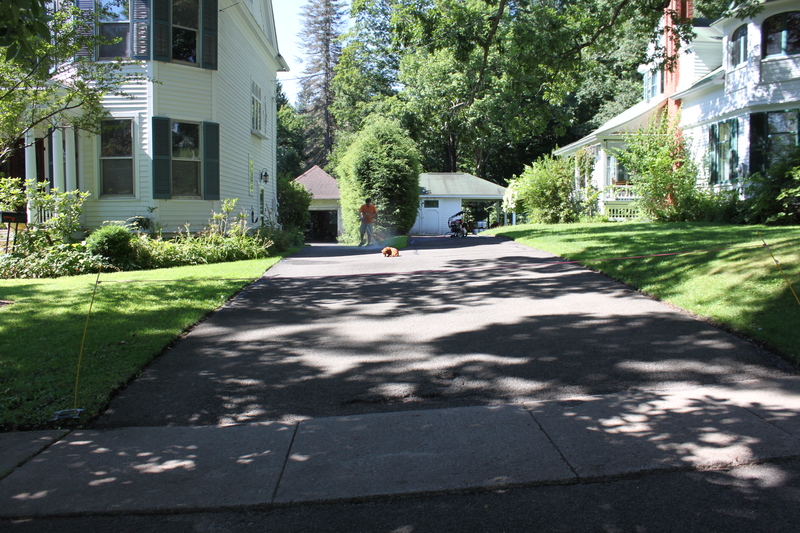 With progress halted for a bit on the garage painting, we decided to go ahead and resurface the drive. It desperately needed it and we had to get it done before the leaves but after the pollen, so a few short weeks in July and early August and that was it. To complicate things, we have a shared drive. We have great neighbors, but as it turned out, they weren’t able to help us do the work. We did strike a deal, though — we’ll do the labor if they can pay for the sealant. So, Bill and I got to work. 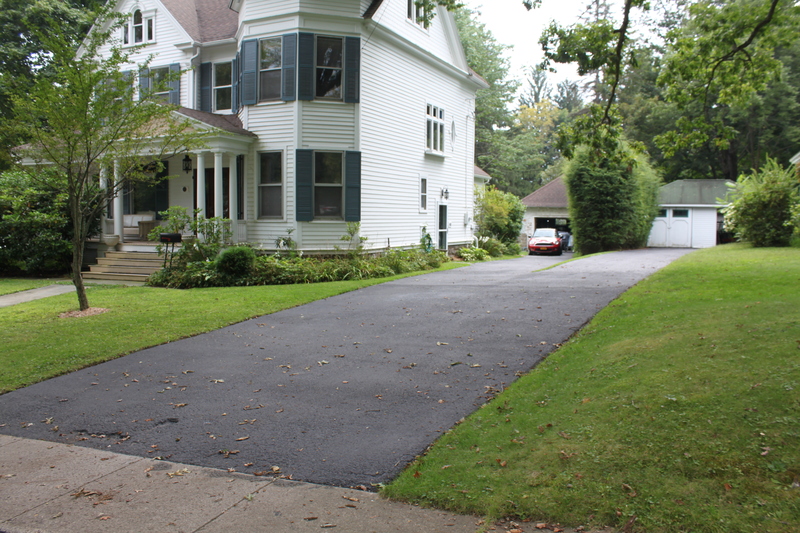 I’d have to say that resurfacing asphalt is by far the heaviest labor that I have ever done, and my back is still reeling. Hopefully, I have not injured another disk. Yikes. Bill and I researched sealants for a while, and the process, and filling cracks and patching. All of the above have to be done in a timeline, preceded by edging the drive carefully and power washing to remove debris. And, each piece of the process needs its own drying time of 24 hours before the next step can be done, whew. Sealants got mixed reviews online and people complained of the companies’ not standing by their products. I was sorta worried that our extremely old and crumbly drive wasn’t going to allow the sealant to adhere. And then, once we started edging and washing, I got really nervous. The drive cracked under the pressure of the washer and the edge was just gravel at some points. 1. Turn the buckets over the night before to allow the sediment to fall out. Mixing, even with a drill attachment, took forever on our first coat. 2. Buy more buckets than you think you need, especially if the drive is rough. Buy at least 5-8 buckets more than you need, you can always return it, but it is hard to run and get it in mid project. 3. Check the dates on the buckets. Don’t use old stuff — it will smell and dry slowly and possibly not adhere. We did end up using one old bucket and found out the hard way. 4. 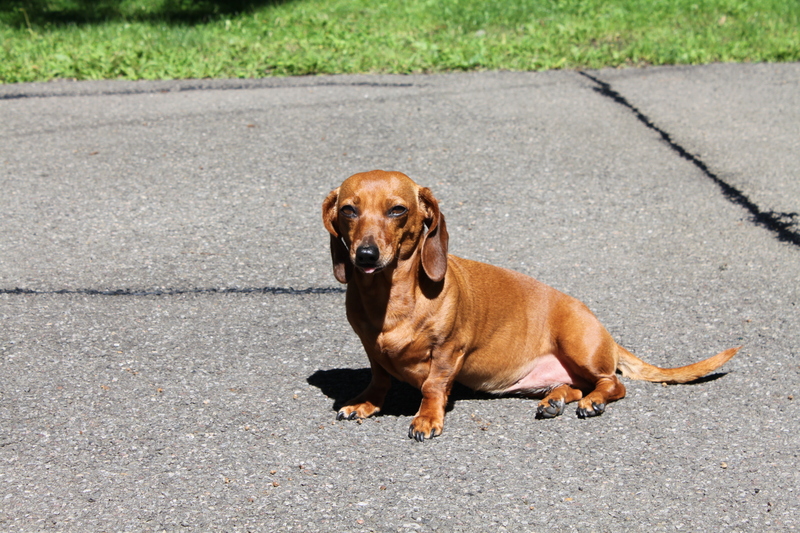 Clean the dickens out of the driveway before you start, you will thank yourself. 5. Follow all the directions to a tee. There is a warranty on the product, but seriously, is the company really going to come and fix your sad ole driveway if something goes wrong? 6. Don’t plan to do anything else the rest of the weekend. And do this with someone as you can blood, sweat and tears together before you pass out from exhaustion. Hey D! Will was actually at our babysitter’s house. There was no way we could watch him and get this done, it took us about 7 hours from start to finish working together! Thanks! I hope you can come visit sometime! Previous Previous post: Enter to Win a Painting!